When GIRVIN had an office in NYC, off 26th and Broadway, I used to walk around, looking in on shops and restaurants. I found a little curiosity shop, a dealer in ancient antiquities and I spied some familiar items that I’d not seen for sale anywhere else. Anywhere. Though I studied them. 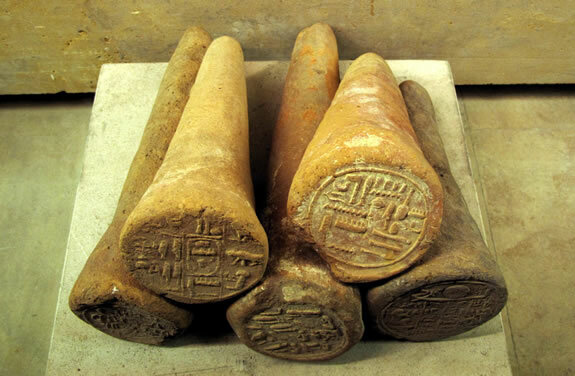 These cones are usually set as prayers, offerings and protective devices, en masse, in the foundations and walls of city compounds and special buildings, such as temples. Most of them are recovered from the third millennium BC. The writing acts as a statement — usually that the building is the property of a God. 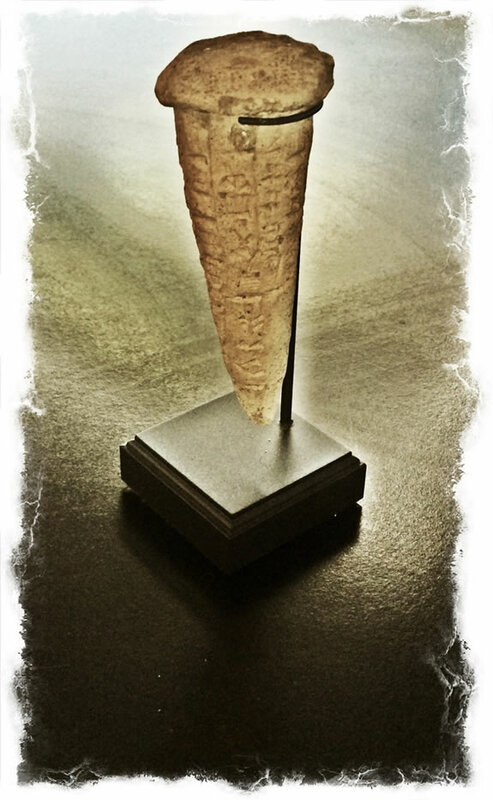 This tradition extended to Egypt in clay nails, inscribed with a “true of voice” reckoning of those passed, a spell-binding found mostly at the Theban Necropolis. As well in the ancient near east, demon-binding bowls of scripts befuddled evil forces that strove to enter buildings and harm occupants. Buried in the foundations, they protected those within. And what would it say? (4) that I am casting and drawing a lot (5) and I made a (magical) act in the dwelling of (6) R. Joshua bar Perahia. I wrote (7) a get (to) the male and female ones, to the ban, the accompanying demon who accompanies and dwells and lives in the house of Ardoi son of (8) Khwarkhshidukh; and any name that it has that appears to them in a dream of the night and in the sleep of the day. And I have written you a divorce writ, (9) a get of releasing and sending away. In the name of a letter from within a letter and letters from within letters and a name from within the names and gaps from within the revealed. By which were subjugated heaven and earth, and mountains were uprooted by them, and heights were melted by them. Demons and sorceries die (lit. – pass from the world) by them. that you may flee and go out from the house and threshold of Ardoi son of Khwarkhshidukh, (12) and not appear to them in the dream of the night and not in the sleep of the day. For I have released you from you from you by a document of divorce, and a get of discharge/dismissal, and letters of separation according to the law of Moses and Israel. (13) For Thy namesake I have done (this magic act), Gabriel (verso) (14) Gabriel and Michael and Raphael and Uriel … in the name of Suriel Suriel … YHWQ YHYQ the great selah. 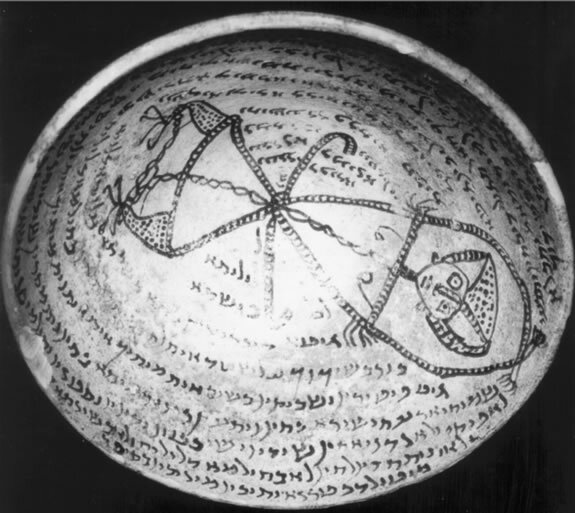 Levene: Jewish Aramaic Incantation Bowls. You might note that the drawing is showing a figure that is manacled. Such as the binding of the spell. 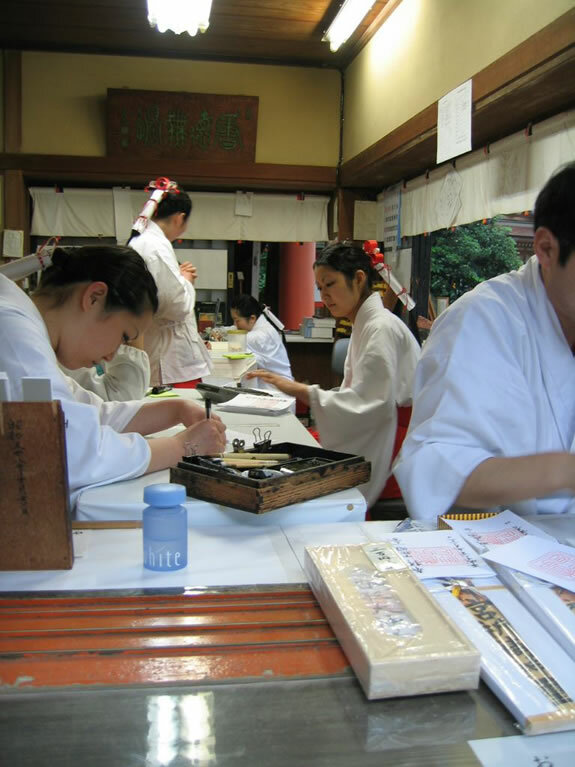 In Japan, the notion of writing as a blessing and protective gesture is common place but less seen by most visitors, but you can find them if you look. 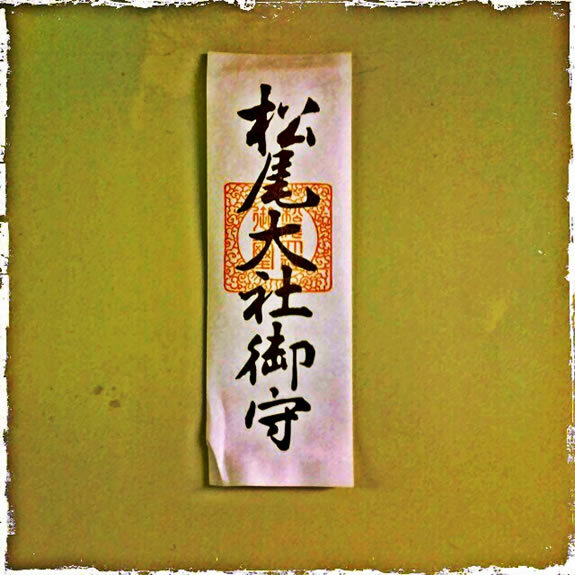 At temple compounds, Buddhist and Shinto, talismans and seer offerings are sold to pilgrims. When I was in Bali, I found many buildings with sigil-like “white flags,” as protective devices for the occupants — made by hand by the presiding village Brahman priest. Why would I think about this — and why would you? There is a tradition in signing, in the U.S., that relates to a kind of paste-it-up strategy — put your sign here. It’s your name. How would you treat it? 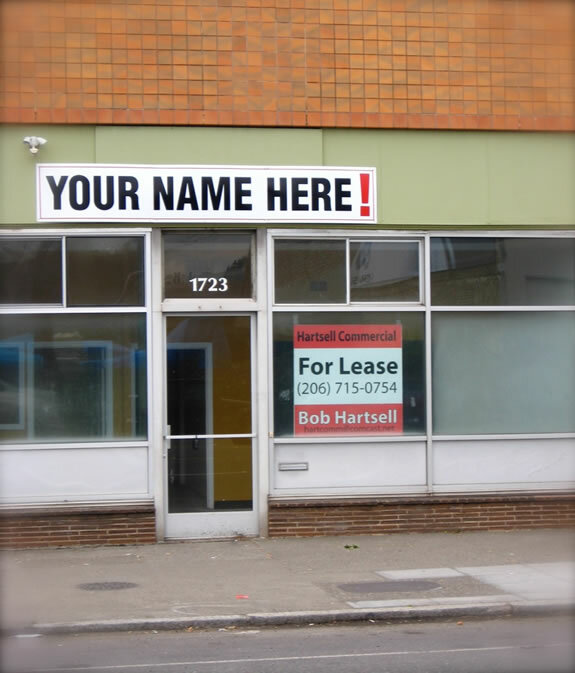 Given the power of a building</em>, as a containment for people, as well as the notion of branding buildings and building brands, thinking about signing as having a deeper dimension, a story begins at the skin of the shopfront. The original GIRVIN signing for Nordstrom, a kind of talismanic badge for a bigger layering of story and experience within.